This post has been a long time coming and I’m SO happy this project is finally complete. 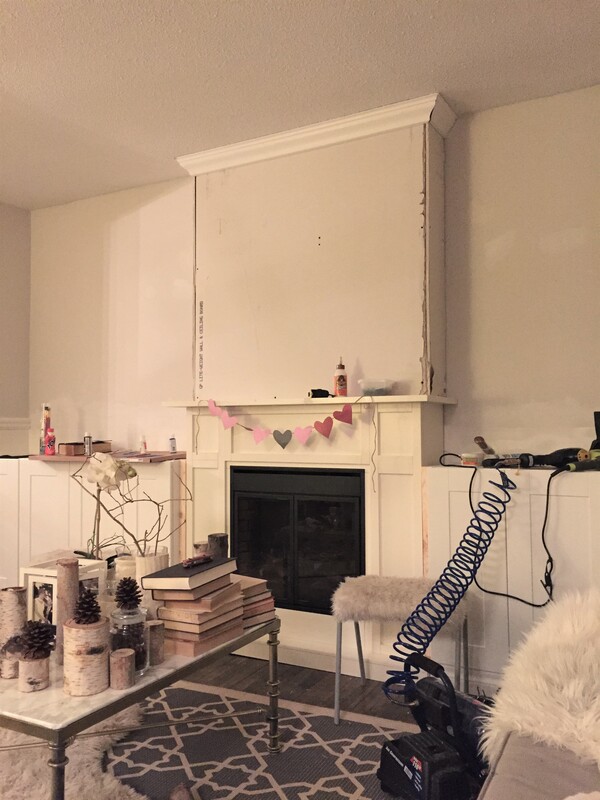 Ever since we first toured our home with a real estate agent, I could envision a white fireplace surrounded by a wall of built ins against this long boring wall. 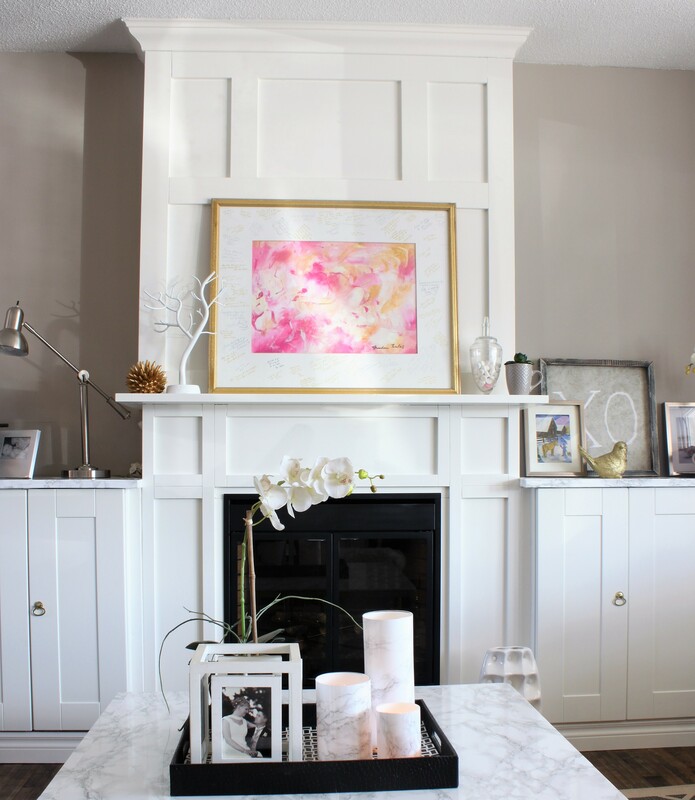 Using Ikea cabinets, I’ll show you how I created Living Room Built ins Around an Electric Fireplace. Don’t be jealous! This is what our formal living room looked like BEFORE. If you follow me on Instagram, I’ve already snuck in few pics of the new built ins, but I’m ready to show a full step by step on how they came together. 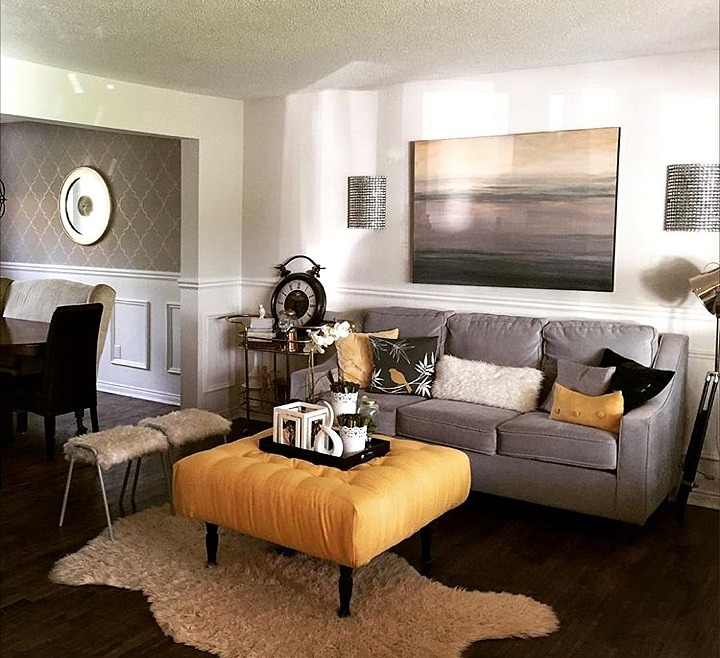 One of the first projects we completed was to install wainscoting the living room and adjacent dining room. 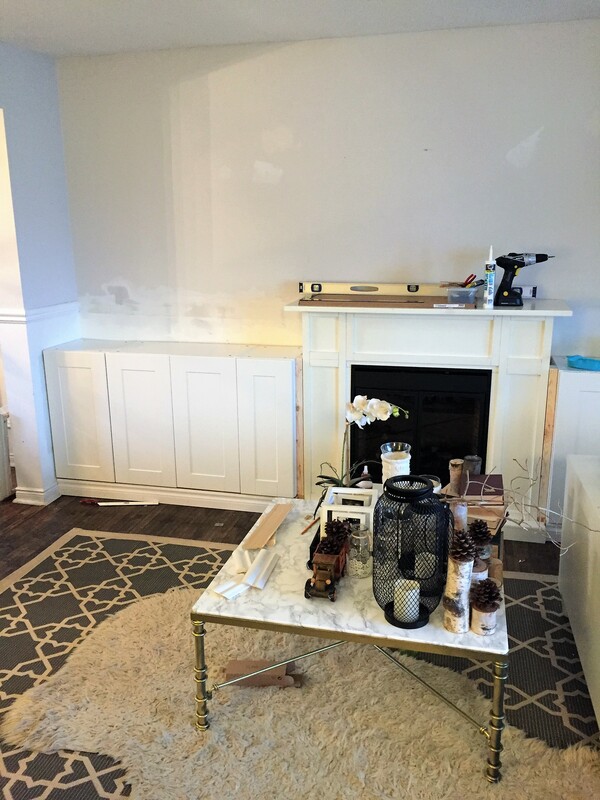 We used pre-made wainscoting boxes that are super easy to install. We lived with the wainscoting for over 4 years, but I always had bigger plans for this wall. 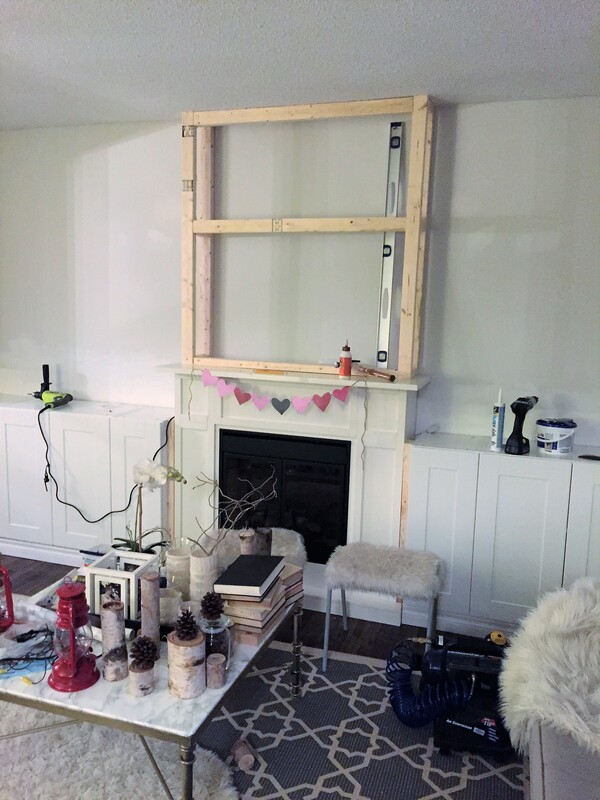 This pic is of our first house where I installed shelving around an electric fireplace in our family room. 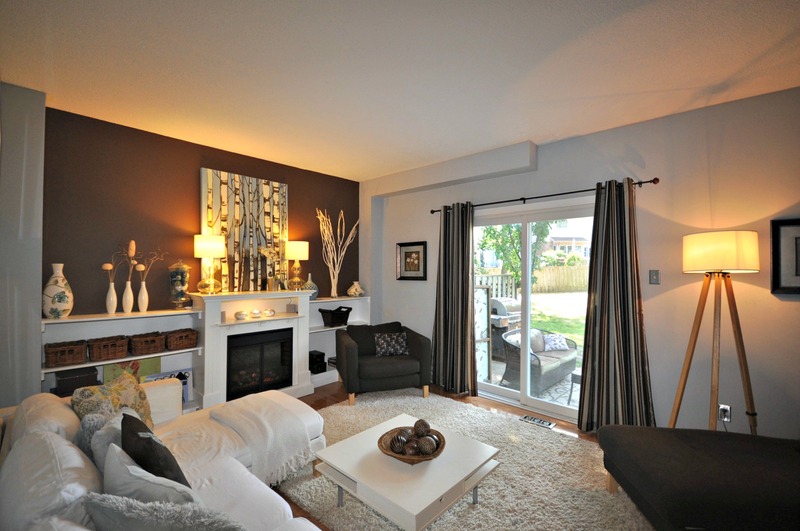 I wanted to sort of replicate this type of look in our new home (just using a different colour scheme). 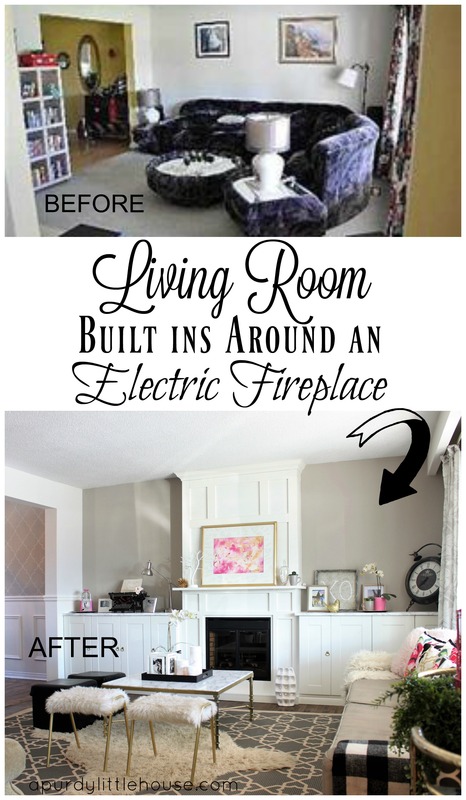 Since our first electric fireplace stayed with our first house, I was on the hunt for another one. I found one on my local buy and sell group for $200. Not too bad considering what they typically cost brand new, and installing a gas fireplace was not in the budget. So, this is basically how my living room stayed for over 6 months. 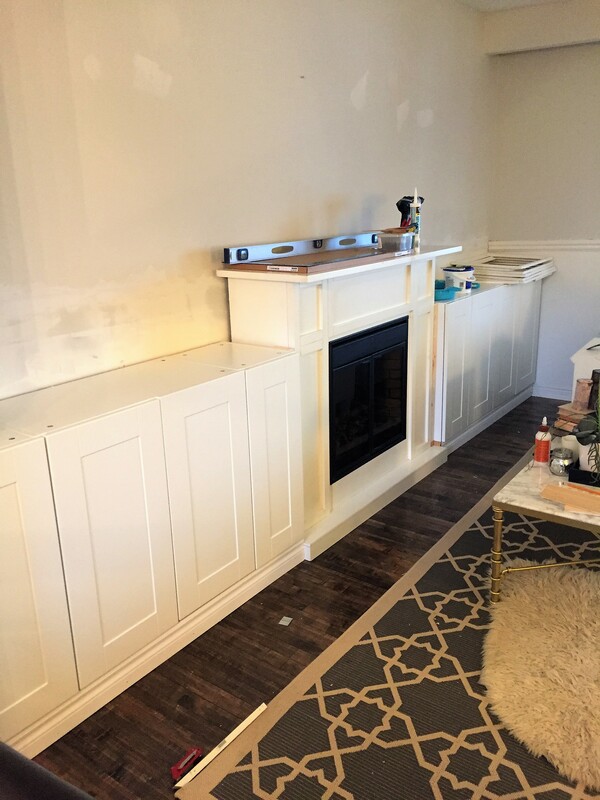 Once I settled on what type of built ins I wanted, I cleared out all the furniture on the sides of the fireplace and we got started with removing the wainscoting and chair rail. 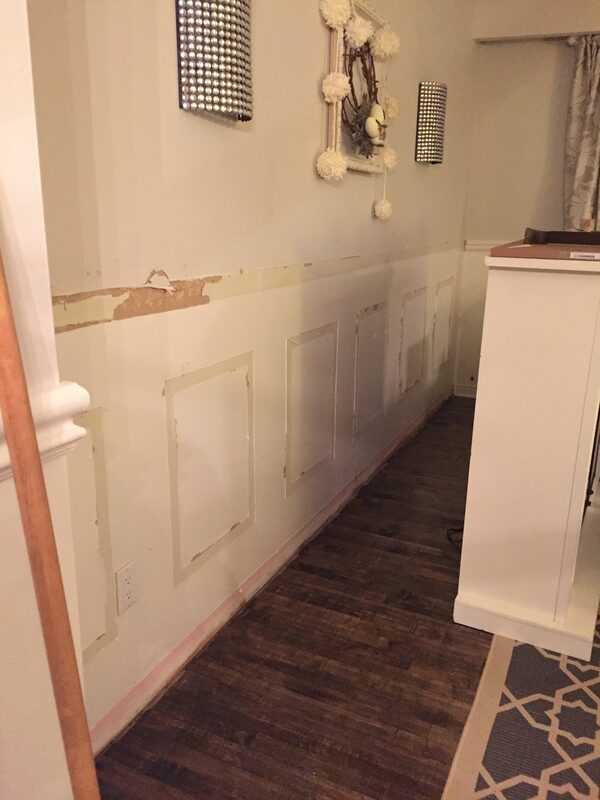 Although I loved the wainscoting along this wall, it was time to say goodbye. I chose to go with Ikea kitchen uppers for the cabinets so I could maximize my storage for all my dining room table decor and serving dishes. 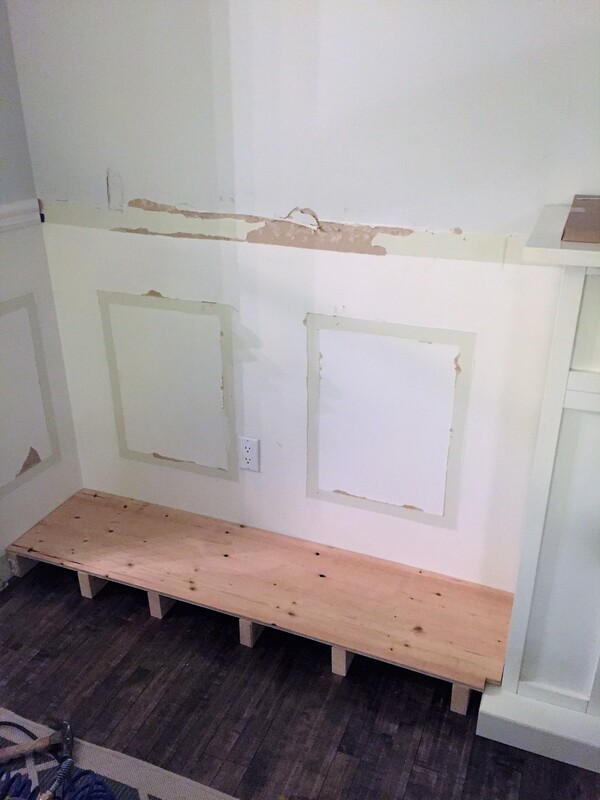 The next step was building a platform for the cabinets to sit on. I didn’t want the cabinets to sit directly on the floor, because that would look weird and they probably wouldn’t have opened and closed properly. 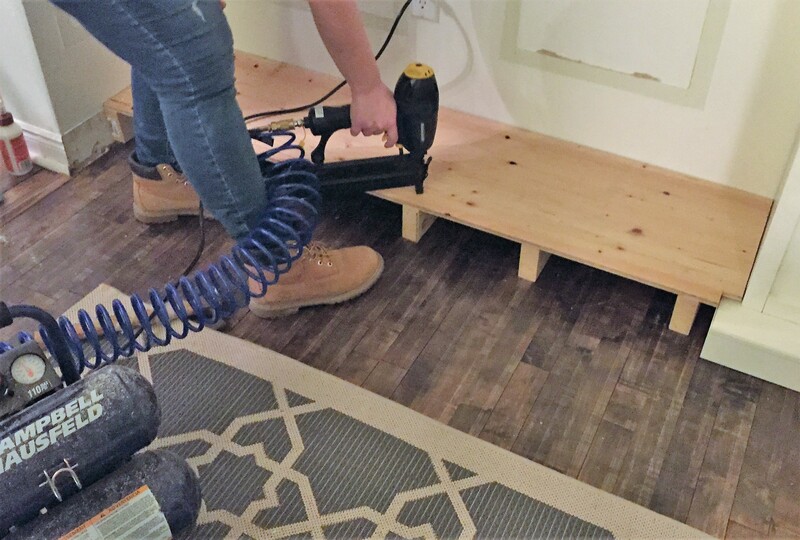 I used wood glue on the 2×4’s before setting the platform in place. It was cut down to size at Lowes, and originally came in a 4×8 foot sheet. I then tacked it in place with a nail gun. 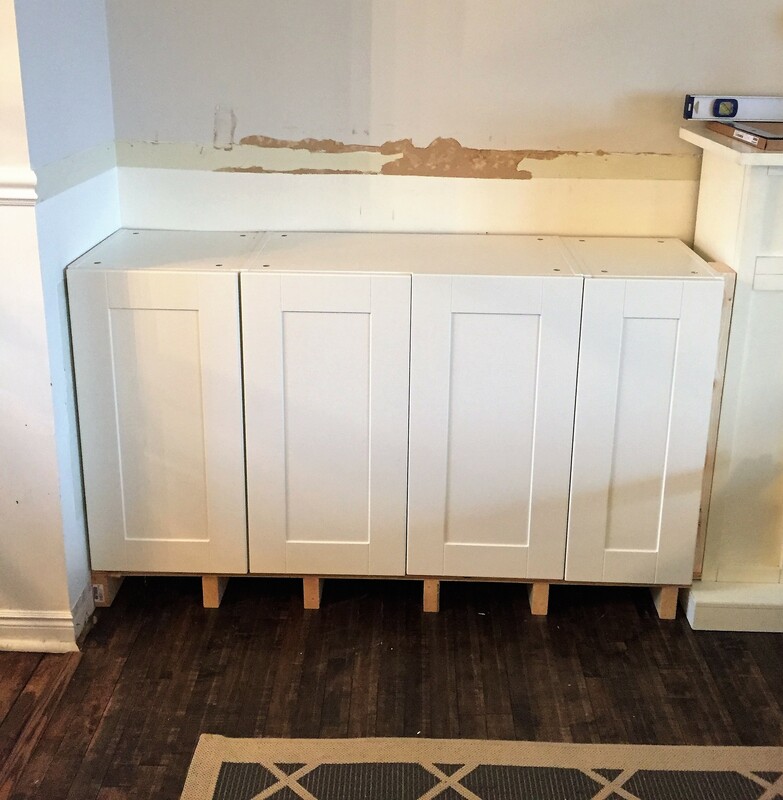 With the cabinets assembled, I placed them on the platform and secured them to the wall. This process was repeated on the other side too. 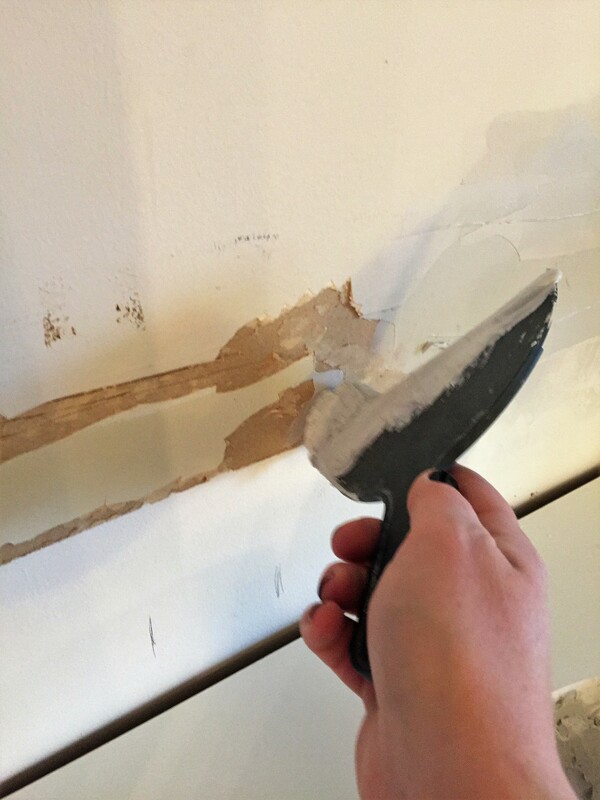 Removing the chair rail caused some damage to the wall, so I got busy patching and sanding. I was originally going to keep the chair rail intact, but after thinking it over, I would have looked very strange along the fireplace wall. I’m glad I decided to remove it in the end. 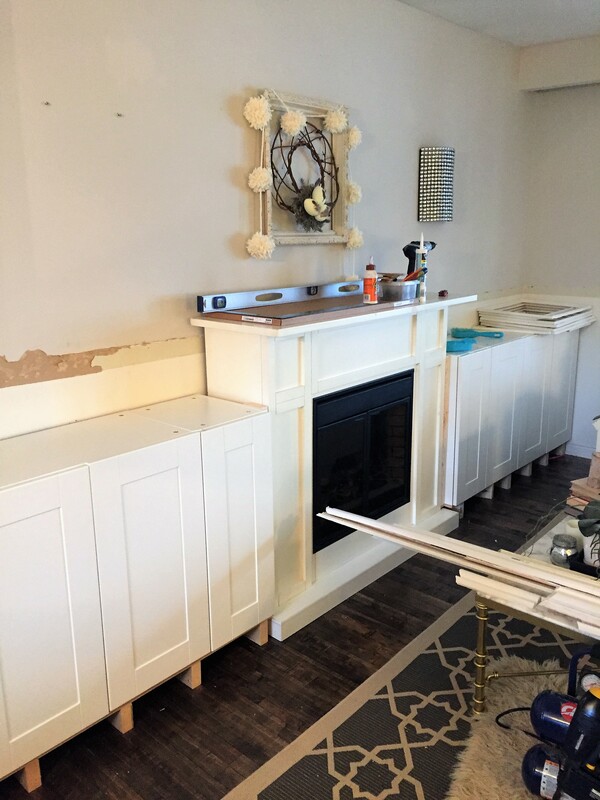 Baseboards were installed and 2×4 filler pieces were added on either side the fireplace to fill in the gaps. I have no idea why I decided to hang a heart banner at this time in the project, but whatever. Next, it was now time to built the faux chimney. Who knew that the ceiling in a 40+ year old house was so unlevel? Lol. Good thing I didn’t build the frame first and then try to install it. The faux chimney was then covered in drywall. 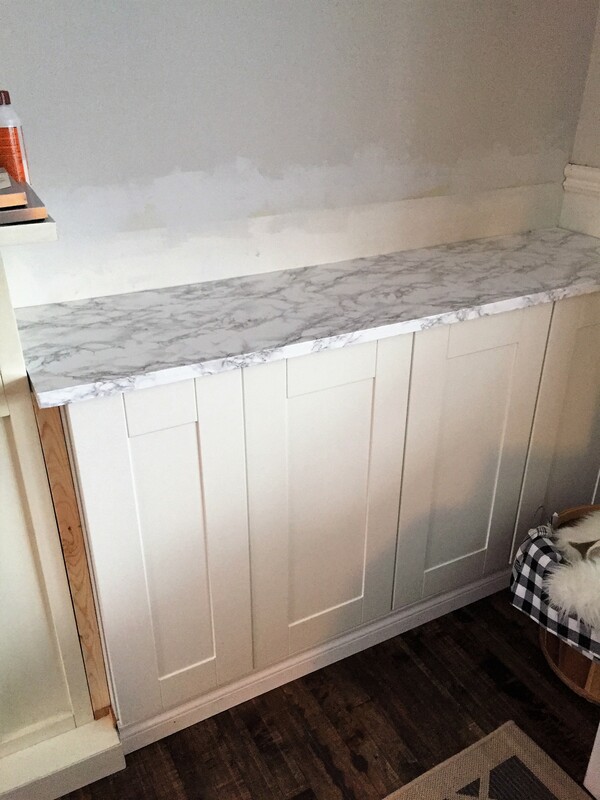 For the “counter tops” on either side of the cabinets, I used my marble contact paper to create a high end look. I simply glued two plywood pieces together to get the right thickness and then very carefully covered it with marble contact paper. Don’t they look like real marble? I replicated the trim detail on the faux chimney that was on the fireplace to make the whole thing look like one unit. For this, I used primed MDF boards from my local building store. 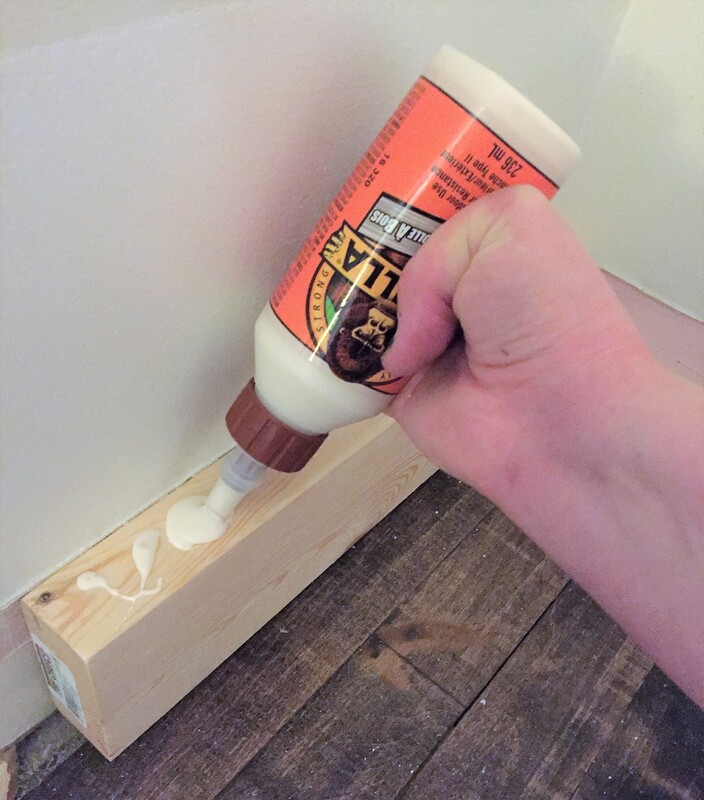 I then added crown moudling and caulked the heck out of everything. The next step was sanding, priming and painting. 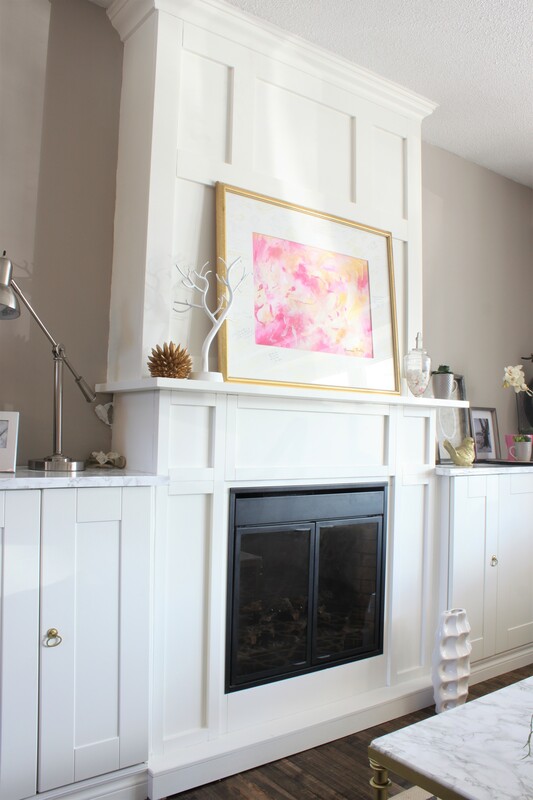 The fireplace colour was more a yellowish white, so I matched the colour of the cabinets, and painted the whole thing the same creamy white. 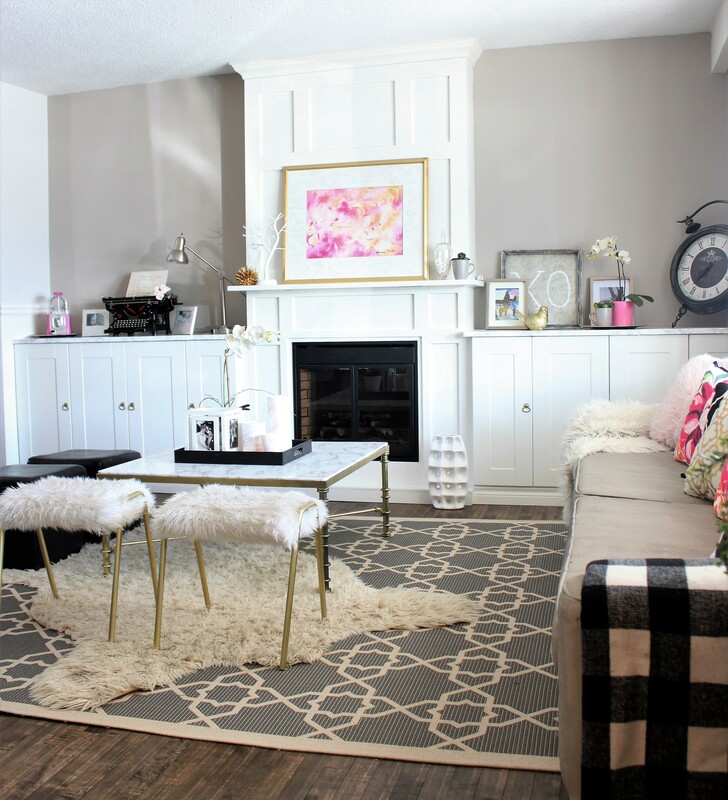 For the accent colour on the sides, I colour matched the same grey that was in the wallpaper in the adjacent dining room. 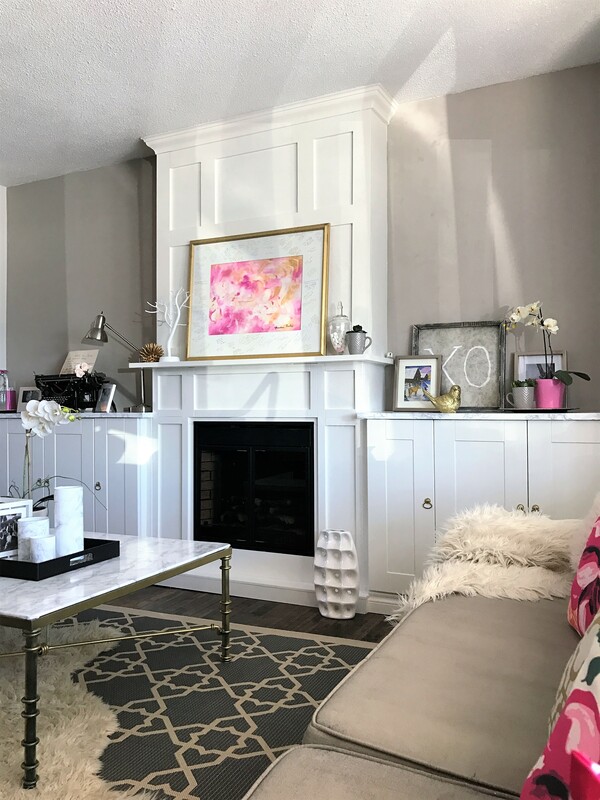 The built ins have made the whole room feel brighter, along with adding so much extra storage and function to our living room. I can’t wait to host a brunch and be able to have my buffet servers set up on one side and a mimosa bar on the other. 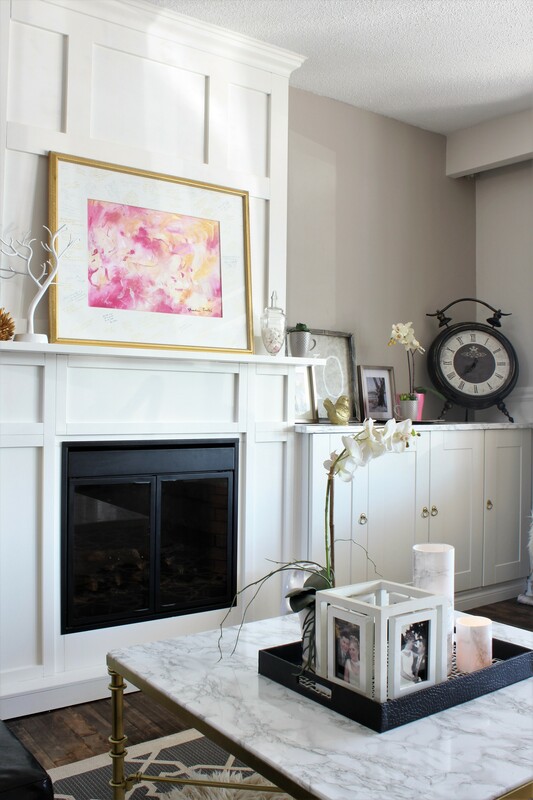 Because this fireplace is a neutral colour, I can change up the accent colours to coordinate with any season or holiday. For now, I’ve gone with Spring pinks. 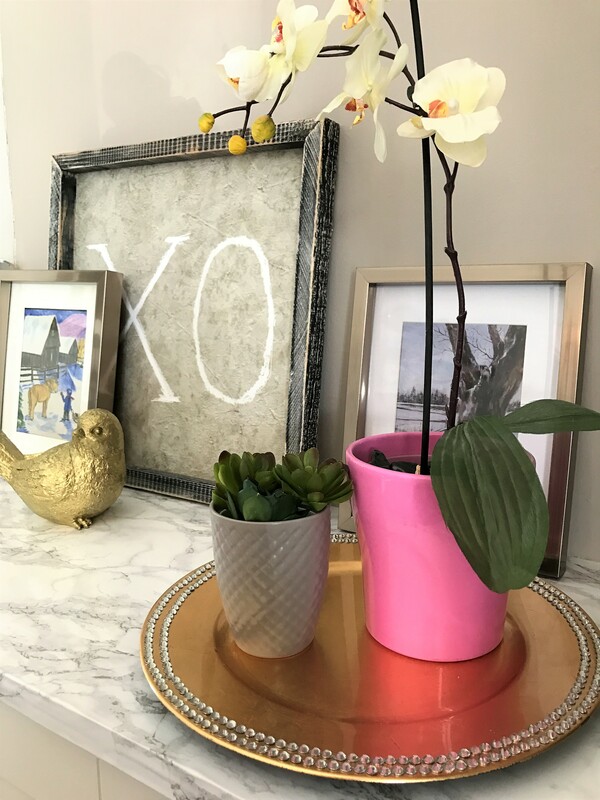 If you want to check out how I created built in shelving above the built ins, click here —-> DIY Built In Shelving. 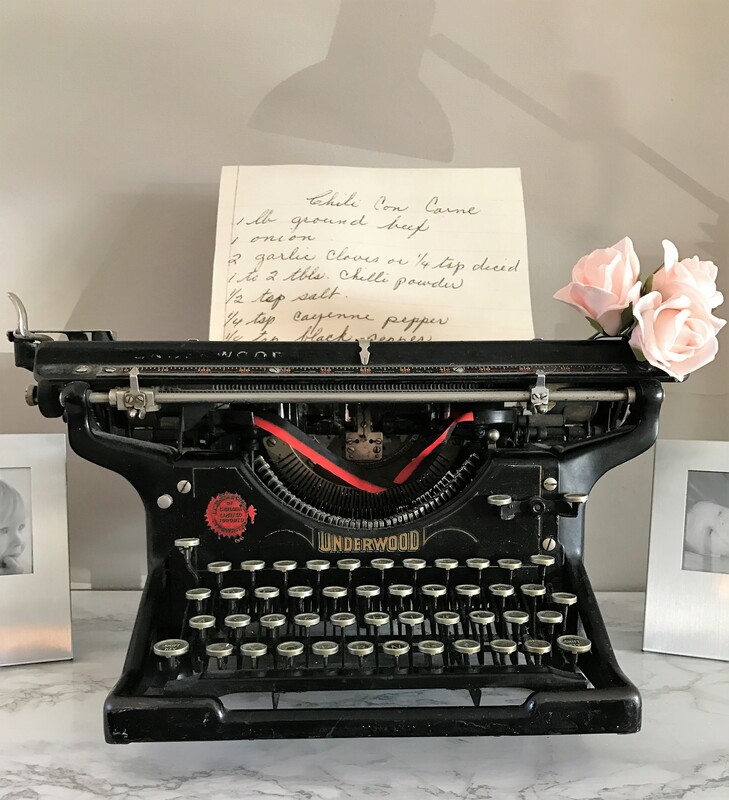 Love this project and can’t wait to replicate it in my home. Question though, do you know the type (brand?) 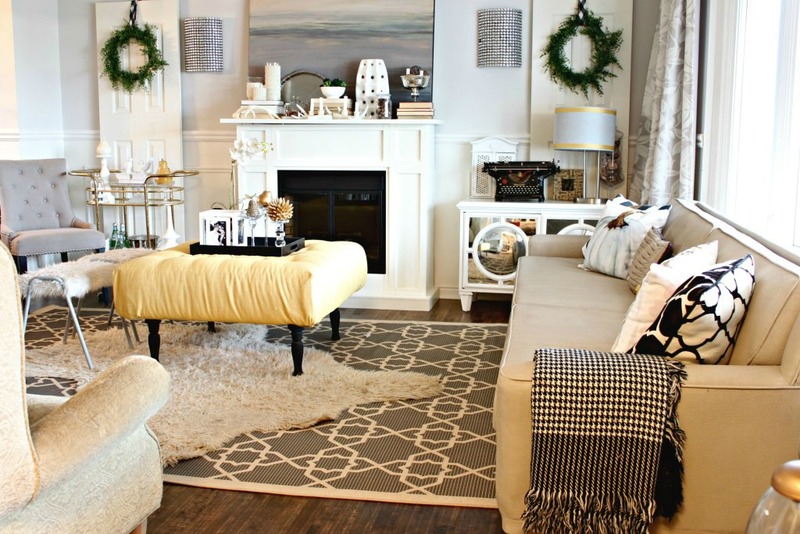 of fireplace? Have you had any issues with needing to service it if it’s attached to the wall behind shelves? Thanks! Hi Caitlin. Thanks so much! I don’t know the type of fireplace, as I bought it through an online buy & sell, but I’m pretty sure it’s from Home Depot. I haven’t had any issues with servicing, as it’s only electric and the unit itself can be taken out of the surround. Best of luck with your project. I came across your blog last night and I absolutely love the transformation!! if possible do you still have the dimensions for your platform as I would love to take your idea and create a built in buffet. Thanks so much!! A built in buffet would be spectacular. I love that idea. I don’t recall the actual dimensions of my platform, but I believe it was around 4 feet x 16 inches. 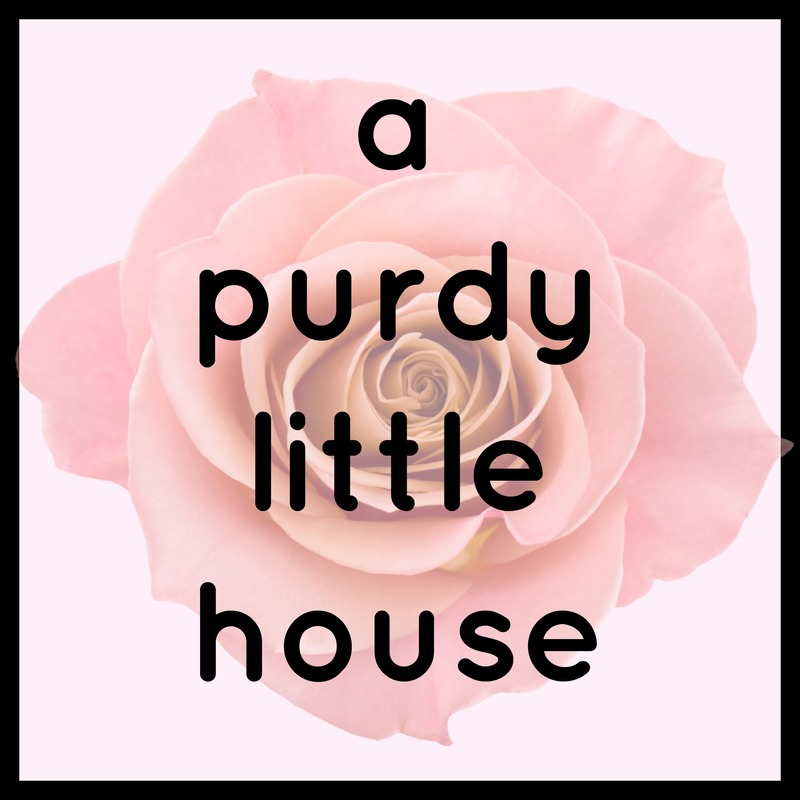 I just found your blog, and I’m so glad I did! This project is amazing- what an impact on the entire room ! Great job! Thank you so much Beth. So happy you found me too, and I’m loving all the new found storage. Thank you so much Susie. I’m excited to have so much more storage.